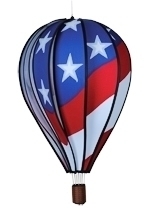 "PATRIOTIC Hot Air Balloon Spinner" Made with fade-resistant SolarMax fabric, this spinner will add a dazzling effect to your garden or porch. Unlike other ordinary spinners made with nylon or polyester, it can withstand daily UV rays, rain and snow. Plant one of these in your garden or on your deck for an exciting color blast. Measures 22" x 15" PLEASE NOTE: Shipping ONLY within the continental U.S. Hawaii, Alaska, and Puerto Rico residents please contact seller for shipping quote before ordering.